Dating websites and senior dating apps are a fantastic choice for those seeking companionship and romance, or even marriage or another shot at happily ever after. Match.com even found love for 90 year old Fia. But before you sign up for a senior dating website, the most important element to online dating is the profile. We’ve put together a definitive list of everything mature singles need to know to put their best foot forward and make the most out of this new journey. Those with children have a valuable resource that can help them build their online dating profile. Here are some of the top reasons why children can be an absolute godsend when starting out online dating. Picking up that virtual pen and singing one’s own praises can be tough. Deciding what to include and what to leave out can be enough to cause serious writer’s block. By enlisting the help of someone who knows them well to at least give initial assistance, mature singles can get the ball rolling. Who better to write about a person than their kids? They’ve lived with the single, know what they’re looking for, and have experience seeing them in relationships, or with the other parent. Most people feel more comfortable talking to their kids as well, which means seniors are more likely to end up with an honest reflection of what they are looking for. By letting their kids take the keyboard, seniors can experience a creative and fun way to put themselves out there. Whether they just help craft the words, or they write it from their own point of view, it will breathe some fresh life into what can be a boring sea of “I like to travel” type of profiles. They could include stories about the single as a parent, showing how important their kids are to them from the outset. Millennials and singles in their 30s have the most experience online dating. It’s not uncommon for them to have two or even three dating apps on their phone at any given time. They are expert at swiping apps, dating profiles and knowing which are the best websites for success. It just makes sense to get their advice before beginning. Those without kids might consider trying a friend who has known them for a while, or even a sibling. The main thing is that support can be key in building an honest and engaging profile. While it’s true that mature dating is a lot less shallow than dating for twenty-somethings, a photo is still absolutely vital. Those leaving the photo space blank might as well delete their profile altogether. OurTime reported that dating profiles with a photo attached may receive as much as 10 times the attention as those without a photo. Variety is key here. One close-up headshot, one somewhere different, such as on holiday to spark some conversation, and one candid shot in which you're laughing or not looking at the camera. These photos can show different sides of the profile holder’s personality and give the reader a chance to see them in different outfits and moods. Even a book to show the single is an avid reader, or a camera if they love taking photos, could be enough to get a conversation started about common interests. Such props can also help photos look more natural. No one is looking for casting photos here. Nowadays, phone cameras are excellent, and can take lovely pics that are clear and make the most of the lighting. If a photo is more than a year old, it’s not going to work. The experts suggest that the photo be changed every few months to keep it fresh. 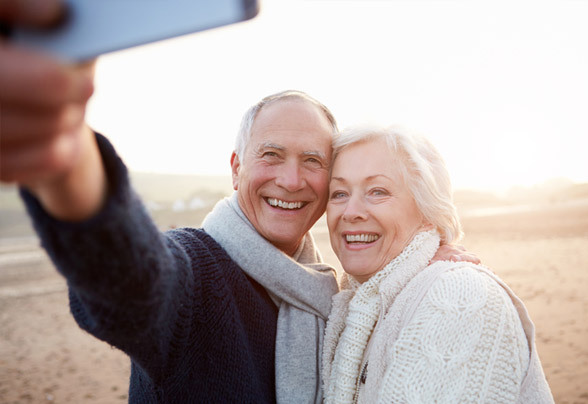 Those who feel old in their photos should take some new ones with bright colors, the great outdoors, or a favorite hobby to keep it vibrant. It may seem obvious, but smiling is a key to attracting online singles. In fact, it gives users a 45% boost in responses. Enlisting a friend who makes you laugh to take some candid photos will bring out your natural smile and bring the desired results. 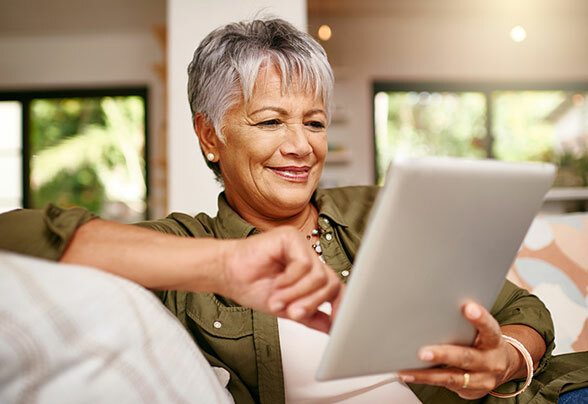 Women are often natural storytellers, so the descriptive part of a senior dating profile can definitely be easier for them. For both men and women, the whole idea of the text in a dating profile is to paint a picture and tell a great story. Remember, when we say story we don’t mean an autobiography. This is not the place for an entire life history. Everyone on a senior dating website, such as SeniorPeopleMeet, has a past and years of baggage or relationship history behind them. The time to learn about all of that is when the potential partners have met in person. A profile is a place to talk about what you're like currently. What are your interests, and how can you show a bit of personality? Dropping hints about stories is intriguing and can encourage singles to get in touch to find out more. “Remind me to tell you about our disastrous family holiday to Corfu” is enough to show that the single has kids and possibly a spouse in their past, and will pique interest to send that first message. A compelling first sentence or profile headline can catch the eye of mature singles. Many singles simply scan the first paragraph, and if they aren’t interested will quickly move on. Users should try to steer clear of anything depressing or sad, such as “I’m a lonely guy looking for love,” or anything negative about what they’re looking for, like “Men with crazy ex-wives need not apply!” Even if it may appear to be funny, it will simply make other singles wonder what drama the profile holder has had in their past, and head in the other direction. A more effective alternative is to think of something interesting or to share a favorite quote. Singles can ask a question, or give the reader a question to ask them. The following are some examples of headlines which create a knowledge gap, making other users immediately want to get in touch with the profile holder. - Guess what I got arrested for when I was 27? Time and time again, we’ve heard people worry about being too specific in their profile, for fear of losing out on great matches. It is not quite so simple. Some expectations and information should be elaborated on, while other issues are best being left for a later date. Firstly, appearance. Attraction is important, but people can never tell who is going to catch their eye. Refusing to even talk to someone who is balding or going grey isn’t smart. None of us are in our 20s anymore, after all. Physical expectations should not be included in a profile, and users are well advised to just see who gets in touch. Who we end up being attracted to can sometimes come as a surprise. Next on the list is age. Women often feel like they need to lie on their dating profiles and make themselves younger, because so many men won’t even look at a profile of a woman who is older. Doesn’t this seem crazy? Does it really matter if the man is 55 and she is 57? There are so many beautiful and active women in their 60s and 70s nowadays who take great care of themselves and look fantastic. Those boxing themselves into a specific age group are liable to miss out on something good. The golden rule is for the single to be specific about what they like, while being open-minded about what they are seeking. It helps us paint a clearer picture of the writer if we see that they “love playing piano, especially Mozart.” However, If someone insists that the woman they want to meet be able to tell the difference between their favorite composers, they’re certainly narrowing the search results down. It bears remembering that opposites attract, and it can be fun to widen our pool of interests as we head toward retirement. For over 50s, online dating can be the most successful way of meeting new people. A mature single’s senior dating profile is their ticket to finding new love and friendship, regardless of their age. It's time to choose from one of the best dating sites for singles over 50 and start meeting new people.